Explanation: To paraphrase Magritte, "This is not a meteor". It's not a picture of a meteor either, but it was taken during last weekend's peak of the Perseid Meteor shower. 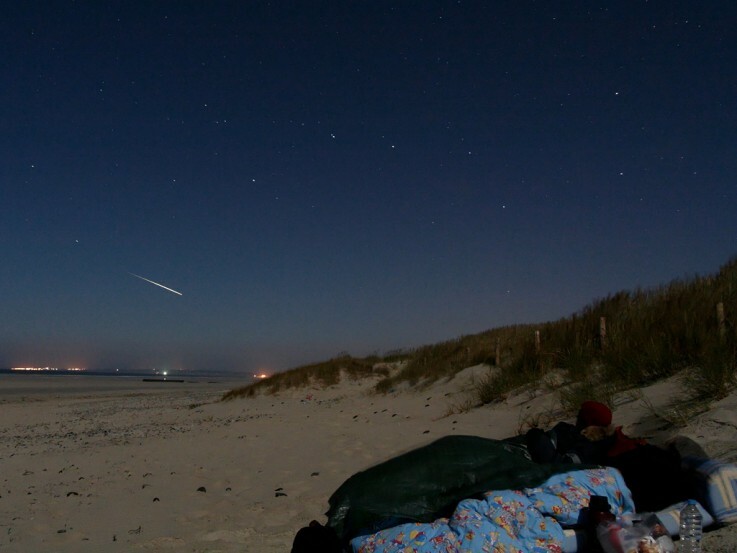 Skywatching with friends at a cosy beach campsite bathed in moonlight at Treguennec, France, astronomer and APOD translator Laurent Laveder planned to record bright Perseid meteors with camera and tripod. While the Perseid meteors he saw were neither numerous nor bright he did capture the brilliant trail of an Iridium communication satellite. His long exposure began after the satellite glint became visible, so the resulting streak does resemble a meteor trail in the final image. Also recognizable in the serene view of sandy beach and starry sky is the famous northern asterism, the Big Dipper.